This question pertains to the LaBianca home as well. Just wondering why NO dog prints were reported at either crime scene. Wondering where they were during/after the crimes? Rudy's were with Garrettson. I would hazard a guess the kitten and Sharon's dog were hiding after all the chaos. Probably in the crime photo section, I think I posted a photo of animal control loading up the pets. Debra Tate said she took one dog home and found another home for another one. Not sure about LaBianca dogs. I think they were Labs which are big dogs. The Tate's kept Sharon's Yorkie, Prudence and found a home for Abigail's Dalmation, Tom. That poor poodle of the LaBianca's looks so devastated. I hope someone adopted those dogs. Didn't Sharon's Yorkie get ran over by VF? She did. The yorkie was a gift from Roman. They named him Dr. Saperstein. Yes two Yorkies, Dr. Saperstein which VF ran over and Prudence who was there when the murders occurred. Oh two Yorkies! Never knew that. Wasn't there also a large breed dog? A weimreiner maybe? I believe this was the same dog Sadie thought took her knife. The Weimaraner was Altobelli's. Garrettson was taking care of it and - a couple of other dogs (I think) - while Altobelli was in Europe the same time Sharon & Roman were overseas. Tom was Abigail/Voytek's Dalmation, and Prudence the 2nd Yorkie. At Sharon's house, there were 2 dogs, her Yorkie Prudence and Abigail's Dalmation puppy Tom. You can see Tom in a couple of the last days photos. It's like playing "Where's Waldo?" but, once you see him, you'll always be able to find him. The bigger dogs belonged to Rudi. Yea that must have been a really good mix of speed and LSD. 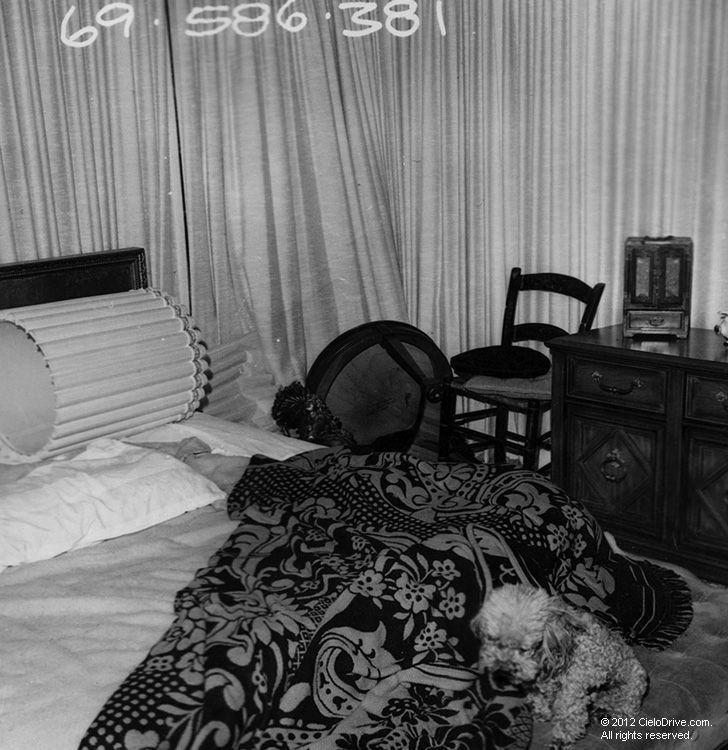 Agreed, this picture makes me sad to see the dog laying next to his owner's body. Susan talked about a lot of things. Prudence's original question was why no dog prints at the murder scenes. I suppose there may have been dog prints but the police ignored them, or maybe they didn't leave prints. At LaBianca there wasn't as much blood splattered around the place so it is conceivable the dogs weren't treading blood around the place. I can't recall the Tate dog(s) - and didn't Gibby or Voytek have a dog? - ever being brought up in discussions regarding Cielo as to where they were during the murders. Sharon had a Yorkie and was feeding a kitten, were they hiding? There had to have been a hideous amount of noise, with all the screaming, Jay being shot, Voytek and Abigail fighting hard for their lives. They were taken away by the dog pound after the murders were discovered, but where were they during the murders? I noticed there's another dog behind Prudence. I can't tell what kind it is. It's not AF's Dalmatian. I have never read anything about the pets except for Rudi's. I would think they would be hiding. I think most would with all the scary noise. GS are very loud.